19th Century Style At Your Fingertips … With Old West Clothing And Accessories. For Serious Re-enactors Who Need Complete Old West Ensembles to Fans Who Enjoy The Look And Just Want A Separate Or Two, Spur Western Wear Offers A Full Line Of Period-Correct Old West Clothing. Browse Boots, Frontier Pants, Shirts, Blouses, Dresses, Ladies' Unmentionables, Vests, Frock Coats And More From Industry-Leading Brands Like Scully, Wah Maker And Frontier Classics. Don't Forget The Accessories To Put The Finishing Touches On Your Outfit. 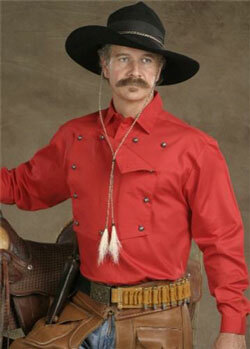 Choose From Old West Replica Non-Firing Pistols, Peace Officer Badges, Wild Rags, Suspenders And Sleeve Garters. Spur Western Wear Offers Accessories From Industry-Leading Brands Including Collector's Armory, Frontier Classics, Pieces Of History And Scully.